Threadless is a T-shirt company. Upon closer examination, it is much more than a T-Shirt company. Threadless is one of the first companies to make crowdsourcing an essential part of its business plan. Threadless gives its social network which is well over two million people creative control over the product it designs and sells. Anyone in the network can submit T-shirt designs that site members vote on. The winners are printed and sold on Threadless.com. At Threadless, the customer is literally the company. Threadless is a social company that has 2.2 million Twitter followers and 753,000 followers on Facebook. Threadless was founded in 2002 by Jake Nickell. His initial goal was to give the creative minds of the world more opportunities to sell great art. In college, Nickell spent his free time online creating and collaborating with other designers. Over time, he became frustrated because their creations were stuck in online forums where only a small community would see them. Nickell wanted to create something more tangible with far greater exposure. He partnered with co-founder Jacob DeHart and they created a contest for the online community to choose the best design. The winning design would be printed on a T-shirt. Their first contest was a hit. As they held more contests, their community continued to grow and a business began to take shape. An important insight from the Threadless story is that they developed a solution for the designer’s problem before thinking about a sustainable business model. 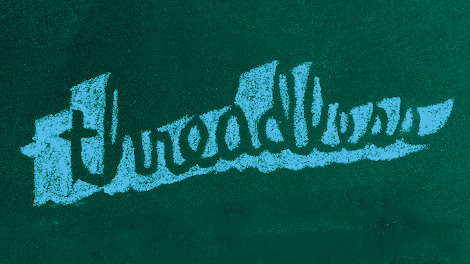 Without its community, Threadless wouldn’t work. Threadless works hard to keeps its designers happy. They provide opportunities for designers to interact on a global basis. Plus, when a design is selected, the designer receives $2,000 in cash, a $500 Threadless gift card and $500 each time the design is reprinted. Threadless has helped many designers gain recognition for their work. Threadless is a great example of an independent brand that was started by a passionate owner who found a better way to connect with his community. Have you purchased a t-shirt from Threadless? I’ve been a fan of threadless since 2006. I have so enjoyed watching them grow as a company. The way they run their business is wholeheartedly for their client…and that is amazing! There is a HUGE sense of community among the bloggers and it’s really really cool. I LOVE THREADLESS! Thank you for your comment. I appreciate it. Threadless has done a great job.